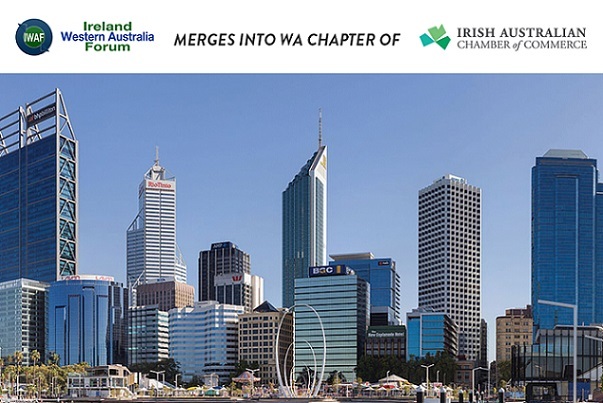 The Irish Australian Chamber of Commerce, the peak organisation for Irish Australian business, is delighted to announce the incorporation of the Ireland WA Forum (IWAF) into the Chamber’s WA Chapter. Since forming in 2011 IWAF has provided Western Australians in business, who share an affinity to Ireland a platform to discuss issues of economic, social and cultural importance to Western Australia and Ireland and the opportunity to build their networks at a local level. The merging of IWAF into the WA Chapter of the Chamber is a positive step which sees a like-minded business group gain access to the national and international opportunities available through the Irish Australian Chamber of Commerce’s extensive network, delivering value to all. Mr Black will lead the Chamber’s WA Chapter and will be joined by an experienced IWAF team. As a director on the Chamber’s main board he will seek to represent the needs and aspirations of the Irish Western Australian business community in shaping the Chamber’s future. The WA Chapter of the Chamber will be bringing a number of programs and events to the Perth market in the months ahead, commencing with the St Patrick’s Corporate Lunch on 15th March, presented in association with PwC, our well-established Mentoring Program and more recent initiatives like our Emerald Leadership Program, Horizons and the Irish Australian Business Awards.